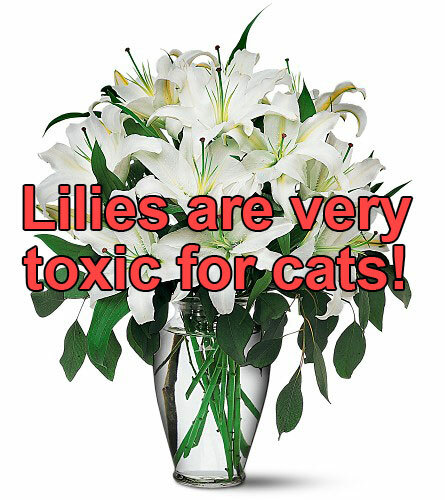 Lilies – Fleur Fatal for cats! And other toxic Spring flowers. Spring is all about flowers and to most of us we look forward to seeing the flowers from bulbs. Tulips, daffodils, lilies. But if you live with cats Do Not Buy Them or bring them into your home. One tiny nibble on any part of the plant (leaves, flowers, pollen) can mean sudden death to a cat. Even drinking the water in the vase holding the flowers can cause death or serious illness. This article talks about how sensitive cats are to all parts of lilies – not just the flowers and leaves, but the water they sit in, and pollen too if the particles get on your cat’s whiskers, feet or fur (this can be fatal). This website has a very good list of plants which are toxic to cats. One Christmas a customer gave us some bulbs which she said to put in a vase with pebbles and water (very Martha Stewart!). The window sill in the bathroom seemed like the perfect place to put them. One night Torti, our feisty little tortoiseshell, was sitting on the back of the sofa when she fell over as if fainting. Cats don’t “faint” like we can. We knew this was very serious so we rushed her to the emergency vet hospital. An hour later she went into cardiac arrest 5 times, and 5 times the doctor defibrillated her. Mystified as why this was happening the vet contacting a colleague, a veterinary heart specialist in another state. The tension was intense. The attending nurses were crying because they had never seen a cat survive more than one episode of cardiac arrest let alone five in quick succession. Torti survived a case of arrhythmia where something causes the heart to slow to a dangerous level which can lead to failure and death. When things settled down the vet and the out of state specialist asked us if she could have ingested anything toxic in our home. Since we are greener than green and obsessed with being as toxin free as possible we were stumped. But we questioned everything in the house and office, and of course felt horribly guilty that we’d done something wrong. The next days were spent agonizing over what could have caused the arrhythmia. Four days later when Torti was discharged and came home the first thing she did was trot into the bathroom, leap on top the sink, and make a bee-line for that vase. It was beginning to flower and we recognized them as Narcissus. I grabbed Torti and shut the door to keep her out. Using Google and the words: cats narcissus heart – there it was! That’s what caused Torti’s near death experience! Torti became known far and wide as Torti Narcissus – The Miracle Cat! Her photo is still on the refrigerator of one of the nurses who tended to her that night. The out of state specialist was so impressed with Torti’s survival and recovery that he flew in to meet her and examine her himself. 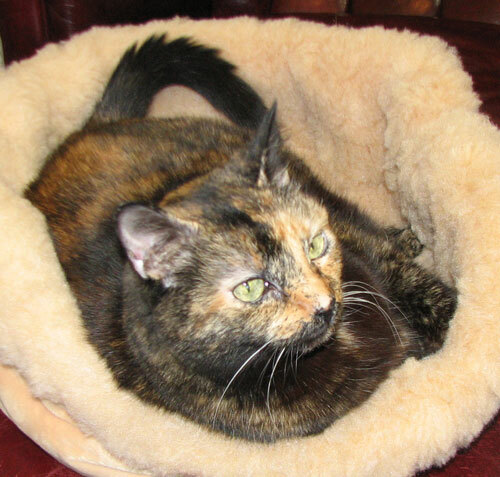 Torti had no lingering effects from her ordeal and she lived another 10 very happy years. Every time she went to the vet everyone wanted to see Torti Narcissus – The Miracle Cat. It sounds like we’ve put the kibosh on giving and receiving pretty flowers! It may feel like there isn’t much left. Don’t despair! Roses – you can’t go wrong with roses, especially when they are locally grown and not sprayed with pesticides. 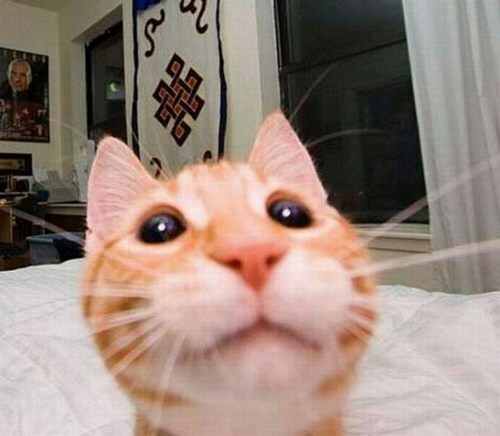 We know cats are very smart, so it’s not surprising they’ve learned how to take selfies and email them around! Comfort Zone with Feliway to the rescue for urinating by the door! Here’s an email from a customer whose cat is urinating by the door. And our response that tells how to use Cat Faeries products and other techniques to deal with it. We have male & female cats. The male is 3 years old and neutered. He is accustomed to going out doors to urinate, however the weather is preventing him from doing that. He is urinating by the door. We have sprayed with a deterrent and he now moved to another area on the rug. Thank you for your order and your note to us in the Comments area of the order form. We thought we’d answer you in our newsletter as we suspect that you are not the only one this winter having this problem. You’ll use Comfort Zone with Feliway spray according to our instructions. Put the Comfort Zone with Feliway diffusers in the rooms in the house where he’s started to pee on the floor. Use Anti Icky Poo to remove the deterrent and urine off the walls and floors near that door. Then place a litter box there for his use until he can resume going outside. Anti Icky Poo literally eats the urine proteins and gases! Put a few drops of the flower essence formula in the communal water bowl each time you change it, or once or twice a day. The deterrent you bought is doing its job – it has deterred your cat from peeing by that door and as you’ve learned the hard way your cat will find other places! Deterrents are never a good idea and they could contain toxic ingredients. Feliway though is safe and when you follow the instructions that we’ll give you with your order you’ll learn how to use it so the cats don’t pick new naughty locations. Now this is very important: normally we are very against putting boxes on top of or near all of the places where the cat is peeing. 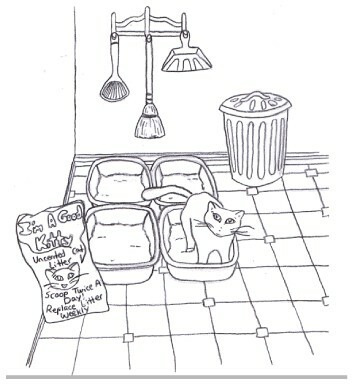 It’s best to create one roomy Kitty Latrine Area where there are a few hoodless litter boxes pushed together to create a large “sand box” with a bag of litter, a scooper, a trash can and a broom handy for your use. A latrine area concentrates the scent of feline urine/feces to one place which is which the cats seek out. 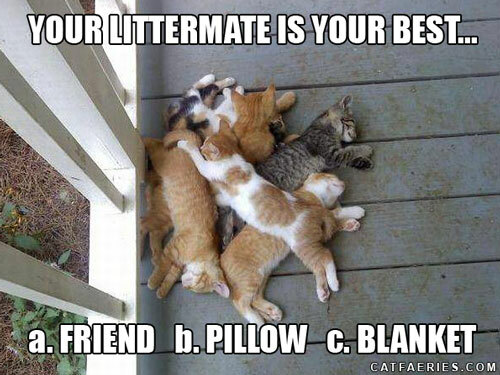 If you put litter boxes in other rooms you are telling the cat that it’s ok to pee in all sorts of rooms! And your problem will get worse. But K.P.’s situation is seasonal. So for the duration of this winter keep a box by the door. When things warm up and he can go outside it’s your choice to keep it there or remove it. Some of you might take this cold winter as a chance to break your cat’s desire for and habit of going outside. After a few months of being inside cats often forget about going outside. We really feel that cats are healthiest staying indoors. Did you know there are 12 cat racial groups around the world? Here’s a fascinating article from the San Francisco Chronicle on a project to map the genome of the house cat. The scientists are mapping the DNA of 99 cats from all over the world. Once they’ve mapped the cat genome, the full database will be posted on the Internet. Researchers will be able to use the information to research cat health links to genetics and cat ancestry. This may someday lead to DNA testing for cats being available to vets to help in maintaining our kitty’s health. It can also help humans, by aiding research for diseases that affect both cats and people. Someday, we may even have a DNA testing service like 23andme for our kitties! Cats may not have nine lives, as the myth goes, but they do have 38 chromosomes. And a team led by a former UC Davis professor is trying to understand those genes by sequencing a lot of cats – 99 cats, to be precise. Leslie Lyons is fond of cats – she is the proud owner of two – but that’s not why she is pursuing this project. As sequencing technology grows faster, more comprehensive and more precise, scientists in general are mapping the genomes of humans, dogs, cows and other mammals. Right now, it’s too early to tell whether protective pet owners or veterinarians would be willing to fork over the cash to sequence their cats’ genomes, said David Kirkpatrick, a spokesman for the American Veterinary Medical Association. “We want to bring the health care standards of our pets to a comparable standard for humans,” Lyons said. The work requires samples from kitties that are spayed and neutered. The cats’ leftover ovaries, uteruses and testicles contain DNA that can be easily extracted. Like humans, cats belong to different racial populations, Lyons said. Felines from the United States, Britain and Canada tend to match up genetically with each other – not surprising, because most share a fluffy ancestry that originated in Western Europe. “They can share that information very easily among researchers, rather than having to ship it around to researchers from lab to lab,” said Dave Mandelkern, president and co-founder of Maverix Biomics, which is operating the website. The data could have implications for humans who suffer from illnesses such as polycystic kidney disease and spinal muscular atrophy – diseases that also affect cats. “Using the tools we had at the time, we can see that there are some genetic factors that might be important,” he said. “To really define them … we really need to move to the whole genome sequencing. Everyone at Cat Faeries, and many friends, have done 23 and Me to learn about our individual genetics. Here’s something fun to know about our founder, Mrs. Cat Faerie – she has 3% Neanderthal DNA. This is .8% higher than average and puts her in the 94th percentile (if only she did so well in school!) Mr. Cat Faerie has some Neanderthal DNA too, his is 3.1%. And you may have some too. This is why a service like 23 and Me, and all the genome research that’s being done, is so fascinating – and fun! And you might learn about some health predispositions.